1.To make simple syrup, in small saucepot, heat sugar and water over medium heat 7 to 8 minutes or just until mixture boils and sugar dissolves; do not stir. Remove saucepot from heat and stir in 10 mint leaves. Let stand 15 minutes; strain and discard mint leaves. 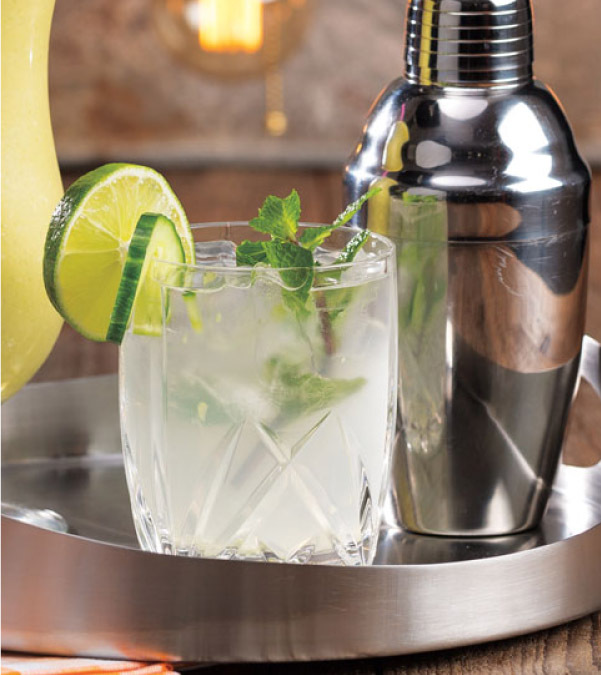 2.Into cocktail shaker or 12-ounce glass, add 2 mint leaves and cucumber; crush in bottom of glass with muddler. Fill shaker with ice; add 1 tablespoon lime juice, 3 tablespoons simple syrup and 5 ounces seltzer. Gently stir; strain over glass of ice and garnish with mint sprigs and cucumber slices. Cover and refrigerate remaining simple syrup up to 2 weeks.